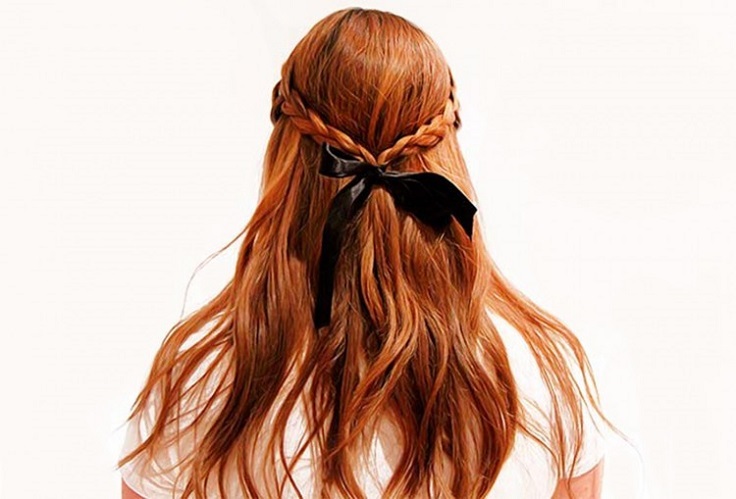 Every hairstyle can look more stylish if there’s a ribbon included! 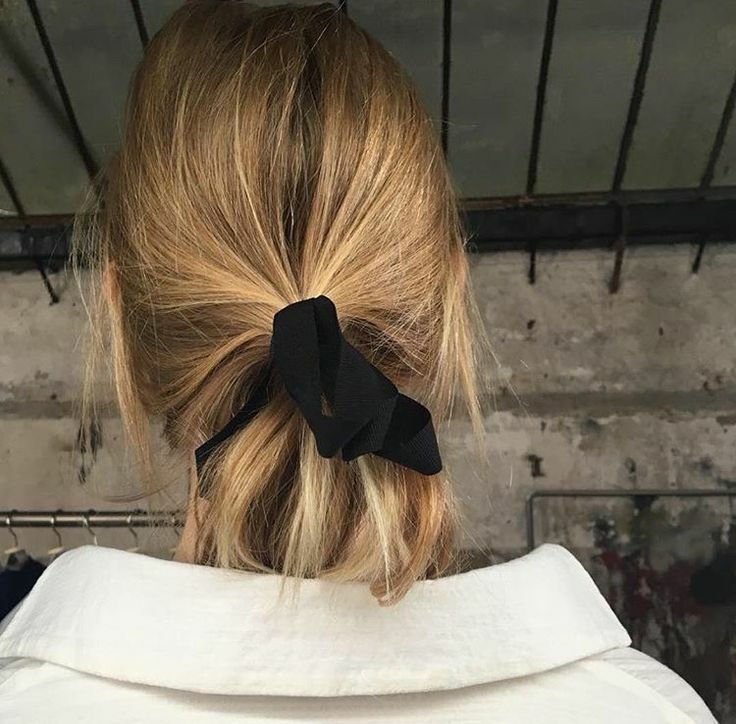 We have so many options when it comes to ribbons and hairstyles, but in this article we are focusing only on those that include a tied ribbon around a ponytail or bun, whatever the hairstyle is. Below you will find ten hairstyles that will be extremely helpful during busy or lazy days, because they all take just minutes and a little bit of effort. Scroll along to see what we choose and we hope they’re going to show you how a ribbon can change even the most ordinary of hairstyles! Low ponytail is the kind of hairstyle that everyone has on bad hair days – it used so often that it kinda loses its charm, especially when it’s done so badly and it looks as if you just got out of your bed and you didn’t make it to brushing it. 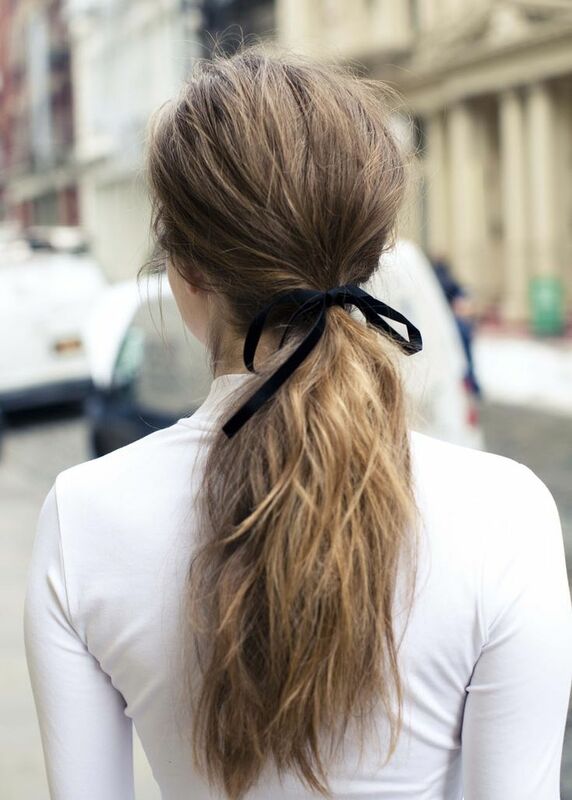 It takes just few small steps to get a chic ponytail – teasing your hair and curling it would give a nice volume, while adding the ribbon around the pony will make it look as if you’ve gotten out of a runway. Probably the easiest hairstyle in the history of hairstyles! No matter how good or bad your skills are, we’re sure that with just a little effort you’re going to make this half up hairstyle. All it takes is just to tease your hair to create a volume and push back the hair strands from the face behind. Secure them with hair tie or bobby pins and tie a ribbon around it. That’s it! And it can’t get easier than this as well. This super adorable hairstyle can add such a difference to your look. You can leave your hair straight like this, or you can curl it – this depends on your preferences. When you’ll have that part done, just take a small piece of hair from near the face, pull it back and start twisting it. Secure it with a hair tie or bobby pin and tie the ribbon as well. Can it get any more romantic than this? Adding a ribbon to two braids is going to make such a lovely difference! If you thought that this kind of braided hairstyle is boring, then we’re sure that the ribbon is going to change your mind. For this charming hairstyle, all you need to do is to make two braids and wrap them together with a ribbon. If you don’t know how to braid, just check out some tutorials online and you will make it no time. If you’re a fan of messy hairstyles, then you definitely need to try this. 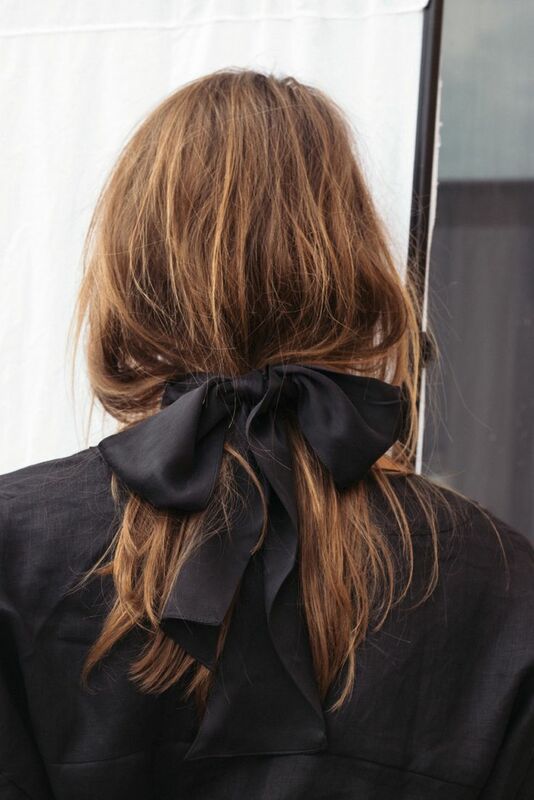 Just take two pieces of hair, push them behind and tie them with a ribbon. You can pull the pieces upwards just a little bit to create the messiness of the look, but you can play more and curl it or tease it – or all. However, this kind of hairstyles proves that when done right, messy hair looks so damn good. This is the type of hairstyle that will be perfect for attending events, such as formal parties, weddings, going outs with friends… You can wear it whenever you want! It looks really interesting because of the way the ponytail is coiled up, and that’s exactly what makes this ribbon hairstyle so special! You might have troubles at first to put it all in place, but after few tries you will see it isn’t a big deal. Here is a hairstyle very similar to the first one we’ve shown you. The only difference between the two is that this ponytail is twisted a little bit – it makes it ideal for those who doesn’t one a regular low and messy ponytail. Also, it’s great to know this one because it will be incredibly helpful on busy days or lazy days. This hairstyle works the best on medium to long hair lengths. When it comes to ribbon hairstyles, it’s important to note that there is one famous actress that made the the half up with ribbon so popular – we’re talking about the one and only, Brigitte Bardot. This wonderful actress that appeared in many movies from the golden Hollywood era was famous for her blond, voluminous hair! If you want to recreate one of her iconic hairstyles, check out the tutorial for this half up by clicking the link below the picture. Low buns are really easy hairstyles that look simple, yet so classy. No wonder why it is one of the most popular hairstyles when it comes to street style trends. To upgrade the look, just tie a ribbon around it! The low, messy bun is just so easy that it will take you less than five minutes, and that’s something we all want – to look good very fast when we’re in such a hurry, right? Enough talking about low hairstyles – again we have the ponytail, but this time it’s more of a cheerleader version. Get your pony up and curl your hair. 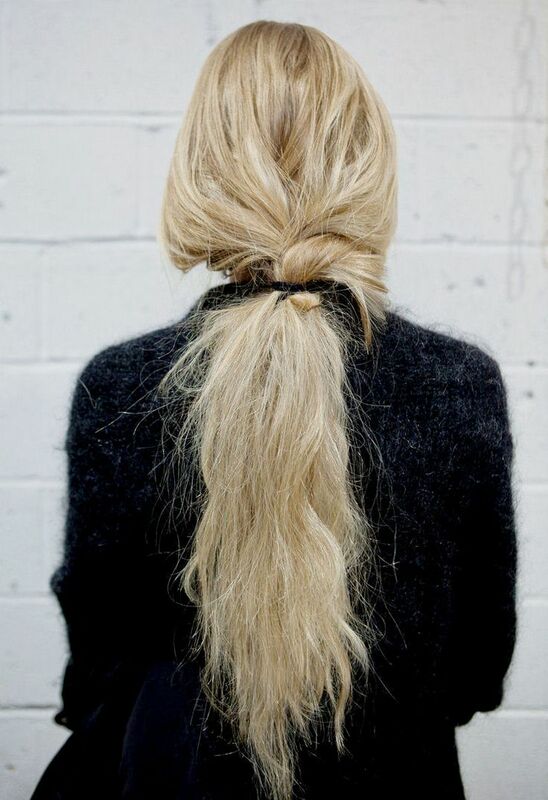 Pull few strands to make it a little bit of messy or if you want to, keep it sleek. After this, just tie the ribbon around and voila! This is an ideal hairstyle for any type of event or for no event at all. We love it!